Want to get outside and have some fun while you help Sheep Pasture? ​Join us for the NRT's 2017 Trail Cleanup Days! Calling all volunteers! 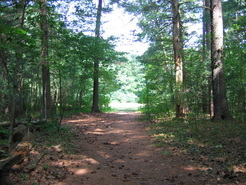 Everyone is invited to work with the NRT staff on the trails at Sheep Pasture. This winter was very difficult for the trees and shrubs at NRT, so there is plenty of trail work to be done to get everything back in shape for the summer months. Volunteers should wear work clothes and boots or closed-toed shoes and bring gloves, and the NRT will provide the rest. Water will be available and volunteers can stay for the whole time or part of the times listed, depending on their schedules. The times and days will be announced in early spring 2017. Check back for new dates and information!